Free Entry with RSVP on Do512! It's not that we're saying we have the best party in Austin, but we kind of have the best party in Austin. 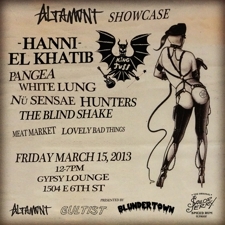 On Friday March 15th, come to Altamont/ Blundertown and Cultist presents The Altamont Showcase at The Sailor Jerry House. If you like awesome bands like Hanni El Khatib, King Tuff, Pangea, Nu Sensae, White Lung, Hunters, The Blind Shake, Meat Market, and Lovely Bad Things, good music by DJs Shannon Cornett and Yasi Cultist, warm happiness by Sailor Jerry, and you know, making memories that will last a lifetime (or about 12 minutes, depending on how much time you spend with Sailor Jerry). For the more cavalier (or just-plain-nuts) Sailor Jerry has teamed up withDowntown Terry Brown to give free tattoos on a first-come-first-served basis. You’ll have your choice between classic Anchor, Cherry, Star, Swallow or Shark but here’s the rub: you’ll have to throw darts at a board to choose your image.